Last March, students in Dr. Erika Bsumek’s Introduction to American Indian History took their midterm exam. Most students earned good grades, but on a mid-semester assessment, a large number expressed interest in some form of extra credit. Students also indicated that since the material was very new to them (secondary curricula rarely emphasizes the American Indian past), they felt that they didn’t have a good grasp on the sequence of events covered in the class. Although Professor Bsumek, the other teaching assistant, and myself were shocked at the overwhelming request for additional work, we thought we’d try something new: a digital timeline in order to improve students’ research and writing skills. A screenshot of the timeline. Digital history projects have grown more popular over the past decade. Professors, instructors, and history educators have increasingly recognized the limitations of traditional assessments. Exams, quizzes, analytical essays, and book reviews — each of these can measure student learning. Exams and quizzes, for example, challenge students to recall a wide-range of information. This can include students crafting and proving original arguments, using the course’s source material in order to support one’s position. Writing essays, on the other hand, provide students the opportunity to work on their writing skills. Recent reports show how this crucial part of literacy is lacking in the workplace. History papers can play a crucial role in developing students’ analytical and writing skills, preparing them to be better in the business world and as engineers. What these traditional assessments are missing, however, are the twenty first century skills our students need. The teaching team for Introduction to American Indian History wanted to create an extra credit assignment that combined the best parts of history education with the core components of digital humanities pedagogy. When we reflected on the midterm exams, we noticed a few things that were lacking. Most importantly, the students were right. They lacked a strong sense of chronology. How would we better equip them to understand sequence and change over time? They needed some tool to help them see these important parts of historical inquiry. A digital timeline seemed like the best way to go. Utilizing course development funds, Dr. Bsumek agreed to compensate me for the extra time this would require. The initial step was determining which online timeline generator to choose for the project. With the growing interest in digital humanities, there are many timeline generators. After less than an hour of research, and after further consultation with Dr. Bsumek, I decided on Knight Lab’s TimeLineJS because of its user-friendly interface. My former colleague, Dr. Julia Gossard (now an Assistant Professor at Utah State University) helped me make this decision as well since she had successfully implemented several assignments in her courses with the program. Knight Lab has created a template from which one could create their own timeline. I was initially wary of the template but, as one can see below, Knight Lab describes what type of information should be placed in which column. Knight Lab Template (click to enlarge). 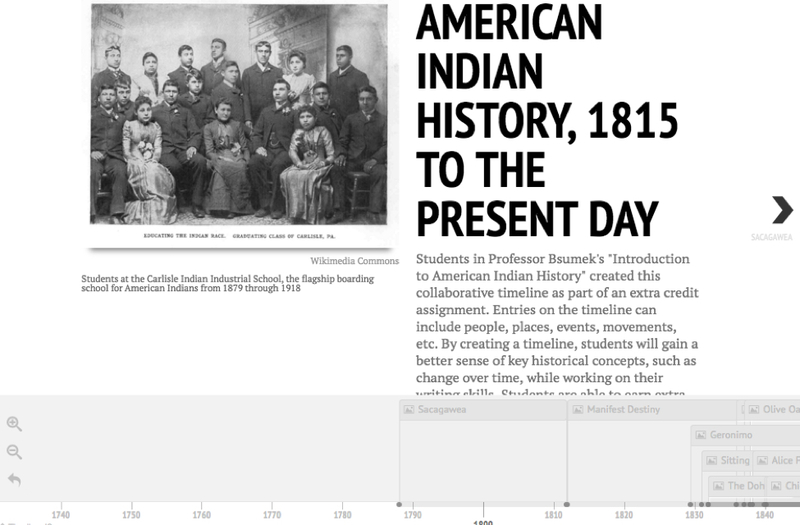 After deciding on the digital tool for the timeline, we created the instructions for students. Students could write a 150-200 word timeline entry for any person, place, event, movement, or piece of legislation from the midterm on. Before writing an entry, students had to write to me to receive approval for the entry they wished to write. Upon approval, I then asked students to find and email me an outside academic source. Only after clearing this hurdle were students approved to write their extra credit timeline entry. The result was a collaborative study tool that students could use on the final exam. Thirty seven students out of the 156 registered for the class contributed to the timeline. I proofread each entry not only for content accuracy but also for writing style, proper grammar, and spelling errors. If students wanted the full points they could earn for extra credit, they usually had to revise one or two times. Most students earned additional points that were added to their final grade. Twenty one students submitted two entries, markedly increasing their chance of earning a better grade in the course. More importantly, they collaborated on a project that addressed the weaknesses they identified when studying for their midterm exams. The final exams displayed a much more sophisticated understanding of sequence and change over time. Students crafted better in-class exams that highlighted a more nuanced interpretation of the history of American Indians. Digital Teaching: Ping! Are you listening? Taking Digital Attendance.